The CF 290 diamond core drill is the ideal tool for drilling strongly reinforced concrete. Its high cutting performance and fast forward speed in such a complex material are unmatched in the market and meet the needs of the most demanding professionals. These excellent results in reinforced concrete coring have been achieved by increasing the diamond concentration in the sectors and thus allowing the tool to handle all the most complex construction materials. 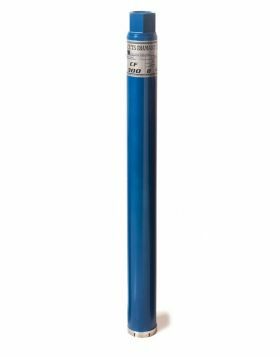 The diamond crown CF 290 has a connection of 1 1/4 ", a useful length of 450mm and is also suitable for drilling abrasive materials, asphalt and mixed walls in general. The sectors are laser welded with a height of 10mm, length 24mm and thickness 3,6mm, 4,0mm or 5,0mm. Available sizes: 42 to 52 - 57 - 62 - 66 - 72 - 82 - 92 - 102 - 107 - 112 - 122 - 132 - 142 - 152 - 158 - 162 - 172 - 182 - 192 - 202 - 212 - 225 - 250 - 300.